If you are experiencing tape envelope sealing issues with your Connect+ 500W, Connect+ 1000, Connect+ 2000 & Connect+ 3000 franking machines then view our help and troubleshooting guides below. Simply find what you need help with and follow our guides to see if we can support you. • There is a obstruction in the moistener pad assembly area. 1. Check that there is enough E-Z Seal® sealing solution in the envelope sealant bottle. 2. Remove or lift the moistener pad assembly. Verify that there is no interference with the pad, that the pad is wet and that there is E-Z Seal® solution in the small reservoir. 3. Check the envelopes, and ensure that the contents are tamped to the upper right hand corner. 1. No E-Z Seal® Sealing Solution in the envelope sealant bottle, or bottle is placed incorrectly. 2. Moistener pad assembly is dirty or worn. 4. Envelopes are not positioned on the feed deck correctly, or side guide is out too far. 5. Envelope flap dimensions are not within acceptable range. 1. Remove the envelope sealant bottle and reposition or refill. 2. Clean or replace the moistener pad assembly. 3. Remove the moistener pad assembly and slide it back into place. 4. Ensure that the envelopes are prepared and placed on the feed deck correctly. 5. Use envelopes that meet the flap depth dimensions for sealing. 6a. Check that there is enough E-Z Seal® sealing solution in the envelope sealant bottle. Refill if necessary. 6b. Re-install the envelope sealant bottle. NOTE: Ensure it that the bottle is held up straight as you re-install. 6c. Remove or lift the moistener pad assembly to see if trough has filled with sealant. 6d. If the trough does not feel with sealant, remove the wick. Let the trough fill and reinstall the wick. 6e. If this becomes a regular occurrence, replace the wick. 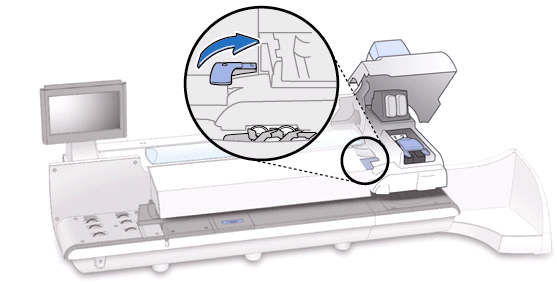 Learn how to clear an envelope stoppage on your Connect+ 500W, Connect+ 1000, Connect+ 2000 & Connect+ 3000 franking machines here. Simply find what you need help with and follow our guides to see if we can support you. 2. Pull up on the top release lever. 3. Lift up the lower release lever and remove the envelope. NOTE: Depending on how badly the envelope is damaged, you may need to replace it. 4. Make sure the feed deck is clear and the lower release lever is down. 5. Push down on the top release lever until it snaps into place. 6. Close the feed cover. 7. Select Resume printing to continue processing mail. 2. Lift up the WEIGH-ON-THE-WAY® (W-O-W®) transport release lever and remove the envelope. NOTE: Depending on how badly the envelope is damaged, you may need to replace it. 3. Make sure the WEIGH-ON-THE-WAY® (W-O-W®) deck is clear and the release lever is down. 4. Close the feed cover. 5. Select Resume printing to continue processing mail. 2. Lift up on the printer transport release lever and remove the envelope. NOTE: Depending on how badly the envelope is damaged, you may need to replace it. 3. 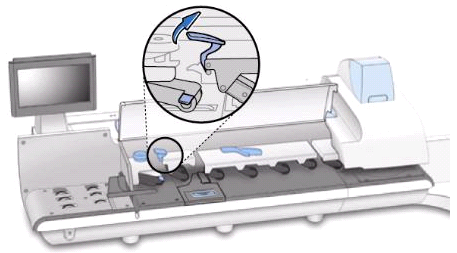 Make sure the printer deck is clear and the release lever is down. 4. Close the printer cover. 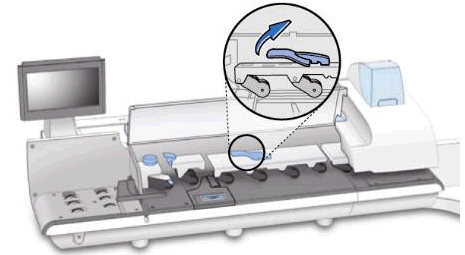 A common issue with the Connect+ Series range of franking machines are scale error codes. When this occurs your franking machine will show an error code. Below you will be able to find a range of error codes that relate to issues with the scale. Follow our help and guides below to see if we can support you. When the scale is not working or the franking machine is displaying one of the error codes below, the scale will not be functioning correctly. 1. Select the Home icon. 3. Select Weighing at the bottom of the screen. 4. Select Attached Scale from the list (Note: If the attached scale is grayed out, go to the next section). 5. Take all items off the scale. 7. Check the scale with a known item. 2. Disconnect the USB cable from the back of the scale. 3. Wait five seconds, then re-connect the USB cable. 4. Follow the cable to the left side of the Connect+ and disconnect that end. 5. Wait five seconds, then re-connect it. • Scales for the Connect+ use a standard USB 2.0 A to B cable. • If you have a Pitney Bowes 1E20 laser printer connected to the Connect+, the printer would use the same cable. • Other office equipment, such as a PC printer, can use the same cable. 5. After everything has been off for 10 seconds, press the power button to power back up. If you are experiencing a bug buddy error on your Connect+ 500W, Connect+ 1000, Connect+ 2000 & Connect+ 3000 franking machine then view our help and troubleshooting guide below. If your Connect+ displays the bug buddy screen and will not operate then the cause is that the operating system is reporting the error. To resolve the issue follow these steps to clear the error and reboot the machine. 1. Press Cancel to clear the bug buddy screen. Note: Saving the bug buddy log file is not necessary unless requested by Pitney Bowes technical support. 2. Double-Tap on the System Shutdown icon. 4. Once the screen has been dark for 10 seconds, press and hold the power button for 5 seconds. 5. Wait one minute, then press the Power button. If the error returns, contact your franking machine supplier. Please have your model number ready. Learn how to resolve a PSD Key Lockout Message on your Connect+ 500W, Connect+ 1000, Connect+ 2000 & Connect+ 3000 franking machines here. Simply find what you need help with and follow our guides to see if we can support you. The Connect+ 500W, Connect+ 1000, Connect+ 2000 & Connect+ 3000 may occasionally display the message PSD Key Lockout and the machine will not run mail. The issue here is that an internal component has failed. To resolve this message, simply follow the below instructions. 4. Wait for the screen to go black and for the blue light on the front to go out. This may take several minutes. 5. Wait 10 more seconds. 7. If the issue is unresolved after following these steps, contact your franking machine supplier and have your model number ready. If you are experiencing tape feeding issues with your Connect+ 500W, Connect+ 1000, Connect+ 2000 & Connect+ 3000 franking machines then view our help and troubleshooting guides below. Simply find what you need help with and follow our guides to see if we can support you. • Adhesive is left on the leading edge of the new tap roll. • The leading edge of the tape is rolled or folded under the tape roller. 1. If necessary, remove the tape roll. 2. Clear the tape stoppage. 3. Re-install the tape roll. • Tape moistener brush is dry due to air block in tubing. 1. Remove the tape sealant bottle and re-install. Repeat as necessary until tape moistener brush becomes wet. • You have selected a mode (such as WEIGH-ON-THE-WAY® (W-O-W®) mode) that requires mail be fed though the mailing system. 1. Change the weighing method.